The concept of holons has been in contention from the early formulations of AQAL to the present day. Even the most savvy integralist might be inclined to wonder: what really are holons? Are holons an ontologically fact about the world (are they real)? And how does such a notion truly contribute to an understanding of the territory and not just the map? The idea of hierarchy and of their constituent part-wholes, or holons, has, as Arthur Koestler points out in the opening quote, a long and distinguished history. There are many philosophers who have proposed abstract systems for explaining natural and social phenomena. In pre-Socratic Greece Leuciddus and Deocritus developed the abstract concept of the atom and used it to develop a philosophy that could explain all observed events. Aristotle used hierarchy as the methodology for accumulating and connecting biological knowledge. Hierarchy was perhaps the dominant way of viewing the connection between the natural, the human and the supernatural orders of being through the middles ages. In the 17th century Leibnitz proposed his "monad" as an irreducible unit for explaining not only the material world but the inner world of the soul. In the early twentieth century there was a flurry of interest in holism and hierarchy that owed its genesis to the impact of Darwin's evolutionary theory. I think the contribution of Jan Smuts in his publication of "Evolution and Holism" in 1926 is particularly important. Smuts was a soldier, a revolutionist republican, a lawyer, the Premier of the Republic of South Africa for several years (before the instigation of political apartheid), a globalist, and one of the founders of the United nations. writers of the UN founding charter. He also was a philosopher who saw the deep connections between the natural and social worlds and his concept of holism clearly influenced Wilber's ideas in this area. Wilber quotes Smuts at the very beginning of his first major work that fully utilized the concept of hierarchy – The Atman Project - "Everywhere we look in nature we see nothing but wholes" (cited in Wilber, 1980). While all these various threads of ideas included the consideration of hierarchical networks and levels and orders of development it was not until the work of writer-philosopher Arthur Koestler that a fully theory of holarchy and holons was proposed. "A new perspective on whole-part relationships is taking shape around the concept of the holon - a term coined by Arthur Koestler to designate that which is simultaneously a whole in its own right and a part of a larger whole. An atom is a whole in itself. When it is also part of a molecule it becomes a holon, or a whole-part. The molecule that is also part of a cell is a holon, as is the cell that is part of an organ, and so on. Nice introduction. But we should not limit the analysis about holons to abstractions and semantics. I developed a topological approach. An engineering design how holons are created. The first topological holons are simple 3D-structures (containers) have three entangled/knotted Membrane layers that make a topological UNION of a yang part and a yin part (= duality). But this UNION acts and is observed as a UNIT. These first holons can couple with other holons to make the more complex levels. Very interesting stuff Dirk, thank you for sharing it with us. 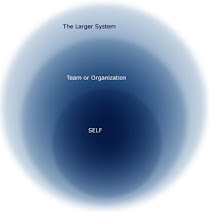 Where do you situate your work within the larger integral community/movement??? I am not active within the integral community, but I like a number of points of view. For sure Wilber is correct on a number of issues, but in example I don't see "social holons" as independent holons but as joined interactive resonating processes, shared by a number of holons. However Genetic holons (like genes, DNA, chromosomes, ...) are real holons because they have ancestor qualities/structure. In my engineering holon approach, holons are local topological unions of energies. Holons exchange different kinds of energies, by direct contact or over the invisible but real membrane (that mediates vibrations). So we have the omnipresent membrane and local holons (specific restructured membrane). Reality is then how a holon translates the outer world in it's proper value system, and positions it's proper function, motion and dynamic existence in the dynamic outer world. However the outer world and proper world are membrane-wise connected and thus constantly interacting and influencing each other structure. The emptiness is explained by the understanding that ALL manifested (every-thing + every-energy) is just structured membrane, and additionally there the giant quantity of non-manifested membrane. 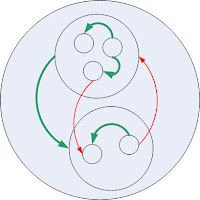 Being or existence is only a temporary state of coupling to become a holon, where holons will decay/decouple again to less complex holons or finally back to pure membrane. Form is the unique way local parts (active + passive, yang + yin, ...) of the membrane are structured /making a unique holon. Because holons are unions of differently oriented energies each holon has - inherent - local stress/tension and dynamics. That incorporate stress gives suffering in various ways. Further in the growth to complex holons more and more couplings of holons will happen, from which a part will be disharmonic couplings. The advantage of an engineering approach of holons over a theoretical AQAL approach is that holons and their sub-holons can be exactly located, ie. 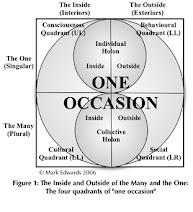 the Mind is the level of interactions/sub-holons (the interface) between the Body holon and the Spiritual holon or ie. the Collective unconsciousness and archetypes are subtle vibrations from deeper membrane layers only observable when daily sensoring is cut off during sleep or meditation, or ie. the term morphogenetic field is about how specific vibrations of a holon are mediated over the membrane and captured by a resonant holon.